The Oceanaire 2OACH Series are portable air-cooled heat pumps designed for permanent or temporary spot cooling or heating applications. The entire air conditioning unit has been built in a premium sheet metal cabinet, equipped with heavy-duty casters for mobility. Oceanaire's 20ACH is a portable air conditioning that can provide emergency heat and emergency cooling capabilities. 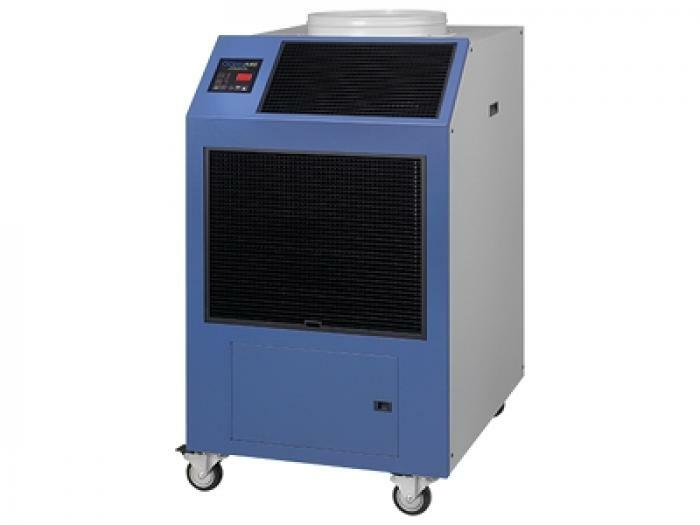 This unit offers the utmost in commercial and industrial heating and cooling power and efficiency. Whether you're up against the coldest winter or hottest summer, the 20ACH is an American made emergency heat and cooling unit that will deliver - year after year. All 2OACH models come with a 10-foot power cord for electrical connection and added mobility in service. These heat pumps direct cooled or heated air to specific areas or objects through a discharge grill located on the upper-front of the unit, while rejecting heat/cool from the top of the unit. The 2OACH models range in capacities from 12,000 BTU/HR to 60,000 BTU/HR to satisfy most space cooling or heating requirements. The 2OACH is a self-contained unit with the entire heat pump system, evaporator and condenser fan motors and electrical components neatly arranged in a gray and blue polyester powder coated metal cabinet. When connected to the proper source of electrical power, the 2OACH unit is controlled by a solid-state electronic controller, with numerous options of temperature and airflow controls that will provide the desired level of comfort when cooling or heating. A wide variety of accessories and factory installed options are available for the 2OACH units allowing for improved performance and added versatility. A wide variety of accessories and factory installed options are available for the 2OACH series units allowing for improved performance and versatility.